"Although Tadhg Murphy offers as fine a performance as one could ask for, it’s telling that the titular character in The Cripple of Inishmaan is played by an able-bodied performer. The lazy interpretation of this would invoke political correctness, but it would be more nuanced to contextualize it within the play’s general movement to keep disability at a distance. 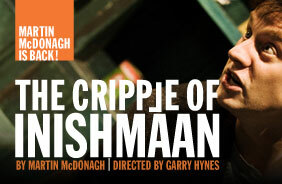 Hence, Irish playwright Martin McDonagh gives us the elements of a sitcom; a rural Irish island, a cast of idiosyncratic characters, and in the middle of it all, a deformed lad named Billy who is constantly referred to as “Cripple” Billy just in case his disability isn’t obvious enough to him. The nicknaming, even from what passes as family for Billy, is the sort of casual, reflexive cruelty that highlights a pervasive lack of empathy towards that which, in any context, constitutes “the other.” But there is outright hostility and contempt towards Billy’s condition as well, most obviously from Claire Dunne’s masterfully violent and spiteful Slippy Helen, although her venom is just as easily dispensed towards everyone around her."